You've caroused like Kerouac. Drank like Hemingway. Partied like Jim Morrison. Which is why we thought you should know what happens when you combine all three—particularly behind a locked door with a "Do Not Disturb" tag hanging from the handle. 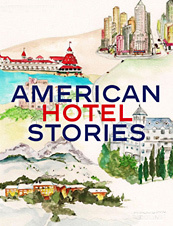 Presenting American Hotel Stories, your new source for history-making travel ideas, out now in hardcover. Compiled by the lovely Chilean native Francisca Mattéoli, the book also includes some handy lists (the U.S.A.'s best mountain hotels, for instance) and some seriously gorgeous photos. So you can read about the Big Sur inn that drove Kerouac mad while perusing the place's lovely oceanfront swimming pool—which looks perfect for a late night skinny-dip. Being the voice of your generation is completely optional.